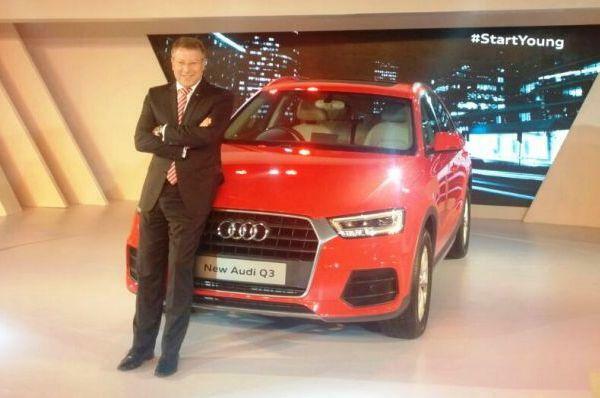 Luxury car manufacturer Audi has launched the new facelifted Q3 SUV in India. Audi Q3 facelift has been priced at Rs 28.99 lakhs (ex-showroom, Delhi). This new facelifted SUV gets styling tweaks to the exterior and interior with some additional equipments. When it comes to styling, the new Audi Q3 gets the family front end with a larger and elegant chrome grille, slimmer headlamps as well as new front bumper with noticable air vents. Back of the SUV shall gets tweaked tail-lamps. The facelifted Audi Q3 comes with 16 inch wheels in the Q3 S, while other variants of Q3 get 17 inch wheels. The facelifted Audi Q3 offers 2 options for interiors – all-black or black and beige dual-tone interiors. Wood trim which was present on older model shall be replaced by textured metallic finish. The cabin present in new Audi Q3 also gets chrome inserts. Talking about the features, the facelifted Audi Q3 offers Audi’s Drive Select powered front seats, dynamic turn indicators, climate control as well as 6 airbags. Other features of Audi Q3 include panaromic sunroof, LED headlamps, MMI satellite navigation, a 20GB onboard hard drive, a 2nd SD card slot, and a brand new sound system. Audi Q3 facelift is powered by a 2.0 litre TDI engine that develops a power of 174bhp which comes mated with seven-speed S-tronic gearbox that has paddle shifters. Audi Q3 is further equipped with Audi’s Quattro all-wheel drive system. Audi Q3 S is comparatively less powerful than the other Audi models with the engine pumping out 138 bhp. The Q3 S is offered with a 6-speed manual transmission and front wheel drive only.